WASHINGTON — A U.S. federal judge on Thursday (May 8) lifted an injunction that temporarily barred the U.S. Air Force and United Launch Alliance from buying Russian-made rocket engines for launching launch national security missions that had been issued out of concern that the purchases violated sanctions against Russian leaders. In issuing the temporary injunction April 30, Judge Susan Braden of the U.S. Court of Federal Claims cited the possibility that money from the transactions could wind up in the hands of Russian Prime Minister Dmitry Rogozin, who oversees Russia’s space industry. Rogozin is one of 11 senior Russian officials sanctioned by the U.S. government following Russia’s incursions into Ukraine. The engine in question is the RD-180, which is built by NPO Energomash of Russia and sold to ULA by RD-Amross, a joint venture between Energomash and United Technologies Corp. 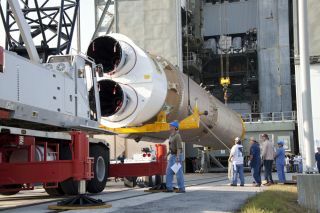 The engine is used on the first stage of ULA’s Atlas 5 rocket, one of two vehicles operated by the company. Braden specified that the injunction would stand pending a determination by the U.S. Treasury, Commerce and State departments that RD-180 purchases did not specifically violate the sanctions. In letters filed with the court May 6, officials with those departments said no decision had been made to specifically label NPO Energomash as a Rogozin-controlled enterprise. Additionally, "to the best of our knowledge, purchases from and payments to NPO Energomash currently do not directly or indirectly contravene" the sanctions, Bradley Smith, chief counsel for the Treasury Department, said in a letter to the court. The State Department's letter echoed that sentiment, while Commerce deferred to the other agencies. Based on those letters, Braden wrote May 8, she was dissolving the temporary injunction. "If the Government receives any indication, however, that purchases from or payment of money to NPO Energomash by ULS, ULA, or the United States Air Force will directly or indirectly" violate the White House sanctions, the government must inform the court immediately, she wrote. The injunction came just two days after rocket maker Space Exploration Technologies Corp. of Hawthorne, California, filed suit with the court, which rules on government contracting bid protests, seeking to block Air Force plans to buy a large number of rockets from ULA on a sole-source basis.